The smallest boat generally mentioned is a "lancha." 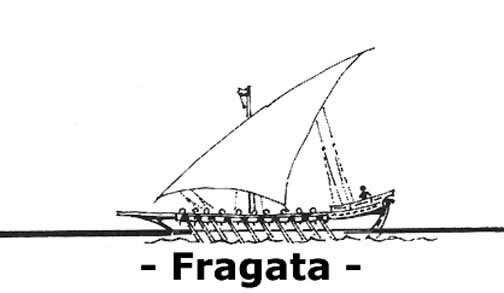 This is an open longboat carried aboard or towed. Others boats of this class could be "botes" or a simple boat and the "esquife" or skiff. Generally they are rowed; however, some have a makeshift sail and mast. Usually a larger version of the lancha is called a "pinaza." The "chalupa" or shallop implies a swift sailing single-deck cargo/transport vessel and could be as large as 75 tons. The "patache" is a fast, row-sailer used for courier and reconnaissance service, but sometimes for coastal patrols. 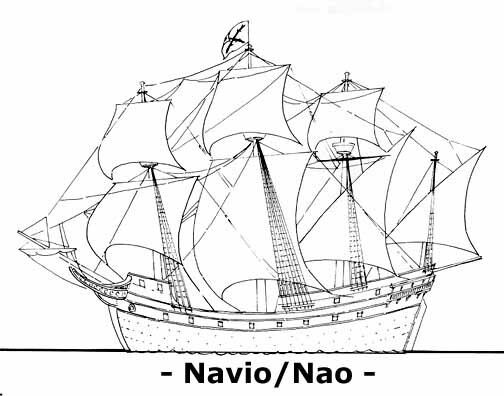 The "barco" can simply mean boat, but generally implies a row-sail freighter, transport or fisherman with a low freeboard for ease of rowing. The barco gavarra is a large version and the barco longo is a small version. 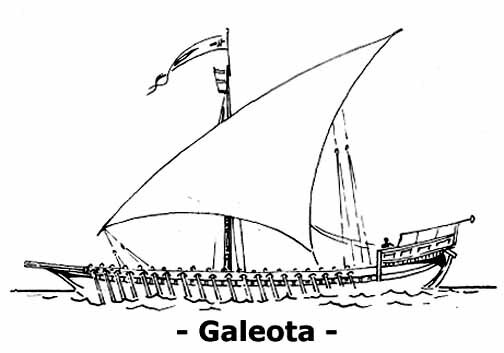 Simply a small galley (single deck) meant as a war ship and often used for exploration. Often has a bow ram and fixed mounted cannons in the bow and stern. Could carry 20 to 50 soldiers which also had to man the sweeps (oars). Could have multiple sails. 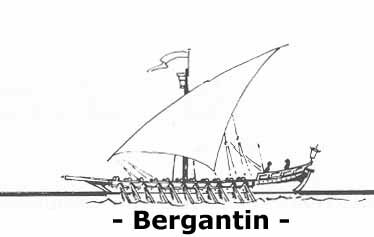 This is a larger version of the bergantin with lanteen sail or sails and oars (sweeps) for propulsion and were in many lengths - up to 200 feet. They were not normally for ocean travel and were of single decked. Normally equipped with bow ram and often with a bow and stern straight ahead cannon. Coastal operations were their primary purpose. 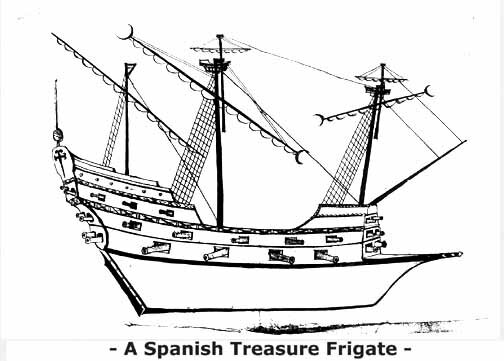 A drawing of the Spanish Treasure Frigate Pero Menendez Marquez. These were especially designed to transport treasure from the New World to Spain. The Marquez was 104 foot in length and 34 foot wide. She carried 150 people, 18-pounders on the main deck, 9-pounders on the upper deck and 3-pounders on the spar deck. Usually multiple sail rigging of square and lanteen design. 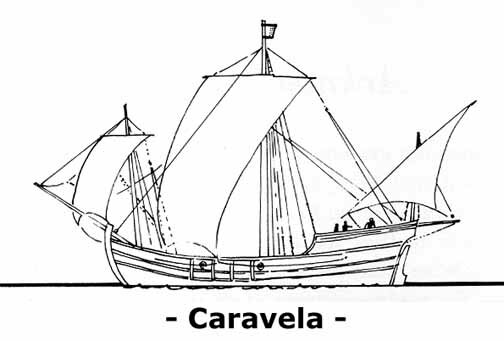 Larger than the aforementioned ships, a caravela probably would be between 100 and 150 tons. The foremast was raked (leaned) forward. It could have a forward and after castle. 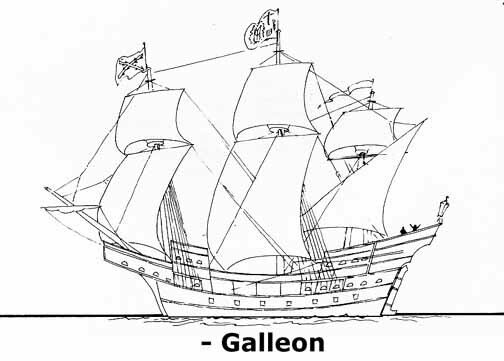 The galleon (galeon) is a large armed ship up to 1,000 tons and sometimes had sweeps for harbor operations. They were often classified as one, two, three, or four deckers and rigged with square and lanteen sails notably with top sails. Large galleons could easily carry a crew of 100, plus 15 to 30 gunners and 50 to 100 passengers as well as provisions and cargo. The largest is the nao which are broader in beam and usually above 900 tons. Generally, the rigging is square sails and were often solely merchantmen as opposed to a warship. Go to Early American Sailing Vessels, Click HERE. Go to a quick look-up subject index, Click HERE.